Sometimes, there are heartfelt shows of affections made by fans for a property. Then, there’s the Planet Express Kickstarter. If the sole preview image is any indication, the game is 100 percent inspired by, and an imitation of, Futurama. 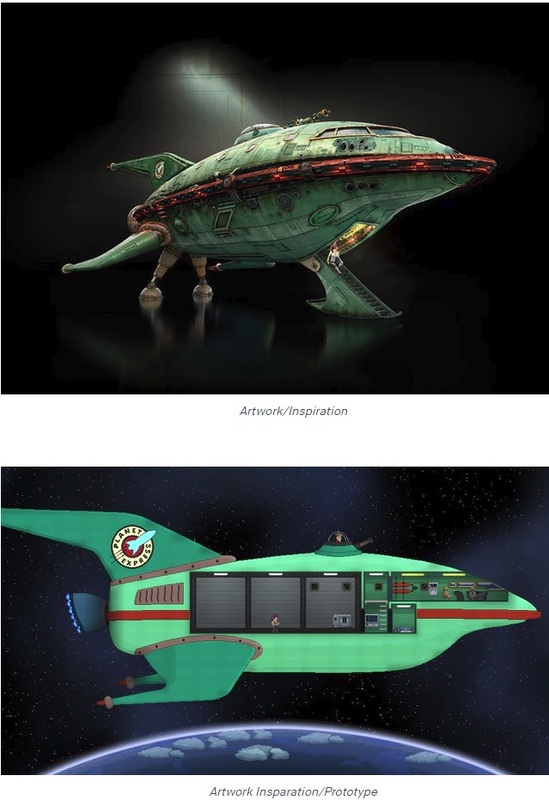 One of the few updates to the project shows as much, titled “Art Work Inspiration/Prototype” and featuring an of the Planet Express Ship above a Starbound image of the ship’s interior. Likewise, the description for the game is a bit cryptic, not really saying much about the world or crew other than that they’re volatile and can include space pirates and regular Federation citizens. To be clear, a fan made Futurama game would be great and could find wide appeal among fans worldwide. 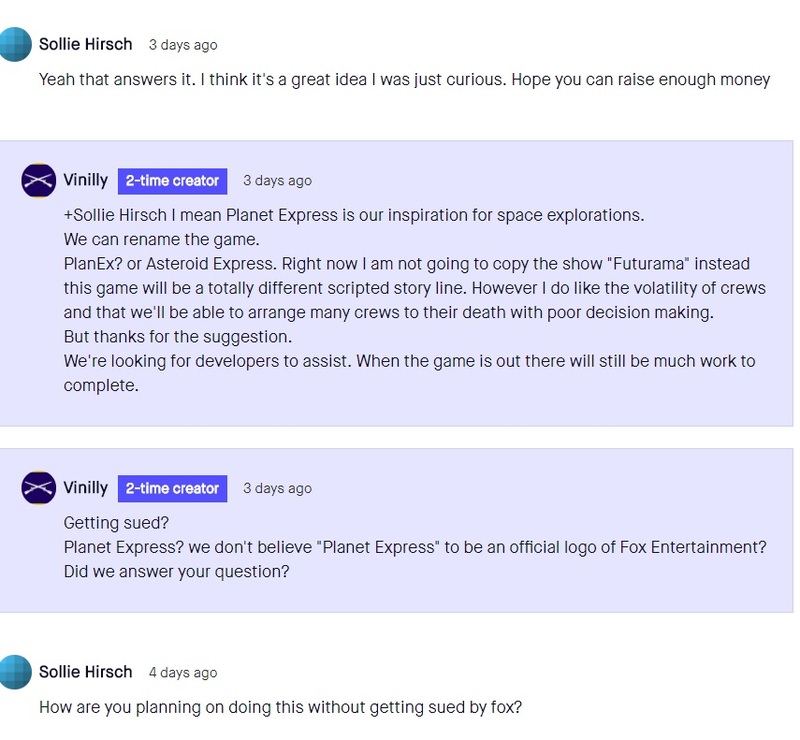 As it is though, developer Vinilly’s campaign comes off more as a scam leading people into a dimly lit alley, and these three elements in particular should have you keeping your money far away from this project. The first, and only, 3D preview images available for the game are admittedly quite good. The 3D take on the iconic ship is pretty eye-catching, and seeing other parts of the show’s world rendered to this same degree would be incredible. Unfortunately, it’s not even from the campaign’s creator. With some digging, you can find that the image is from a collection of art works created by online artist Alexey Zakharov back in 2014. The founder of the campaign, meanwhile, is a completely different person who lives in Illinois with no notable game or fan art. A cool stolen image only takes you so far though. When prospective patrons go to a campaign page to learn more, the description is what will help sell them on what’s planned for the final product. At the moment, this campaign page reads cryptically at best and deceptively at worst. Specifics for how the game will be developed, the business model being used to ensure funds are allocated properly and several other key elements are all notably absent. Which is a bit disheartening; much like fans of Futurama, editors, ghost writers and business minded people can be found across the internet, on discussion forums and otherwise off the street who could’ve helped make this page shine better than it does if it were tied to a legitimate project. Above all else though, the campaign gives no regard for copyright law. Here’s the kicker: No matter how good your fan game may be, it’ll all be for not if and when the original owner of the property tears it down with copyright claims, in this case Fox and Matt Groening. It’s something they made, and no matter how much you love it or how sincere you are with them about this fact, they won’t let you profit from their idea in any way, shape or form in order to ensure it remains theirs. Sure, there’s the chance they could take a shine to the finished product and offer to work with you on something they certified and approved, but it’s exponentially more likely you’ll lose months or years of your life’s work in legal disputes. As it stands, any money put toward this project will be funneled toward this garbage disposal of a fate. If you need proof, check out a thread of comments on the game’s update page where the creator shows a limited understanding of how copyright law works, if at all, with a skeptic viewer. Again, the prospects of a large scale Futurama fan game is awesome, but as it stands, Planet Express is not remotely that project. In the mean time, check out Xeno Crisis and Blossom Tales, two titles which deliver on the fan made love letter game archetype.